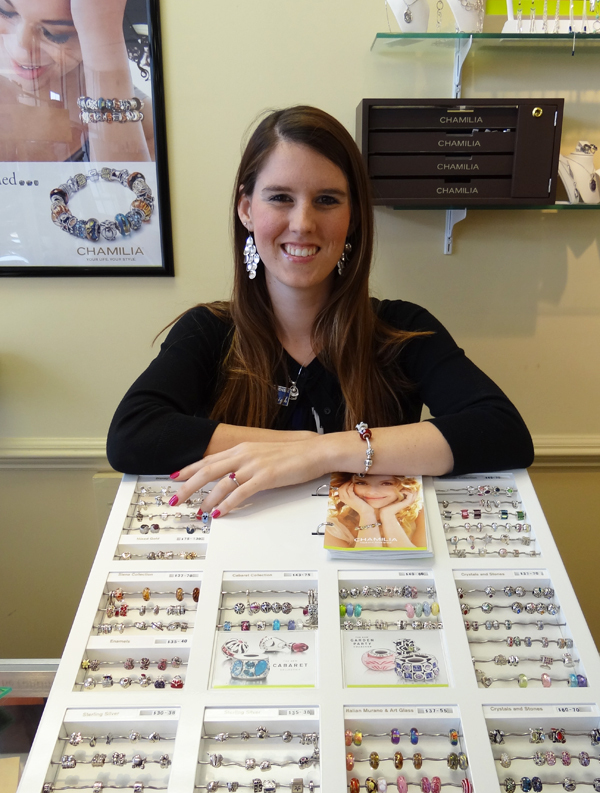 The Employee Jewelry Pick for this week is from Ashleigh at our Northeast location. She picked the lovely beads and jewelry of Chamilia. Why did you pick Chamilia? – Chamilia is wonderful jewelry company, because you can make the pieces personal. You can add your own touch to a bracelet, necklace, or earrings. Are Chamilia pieces interchangeable with the necklaces, bracelets or other pieces? – Yes, they will fit on all the adult size pieces. The Miss Chamilia line won’t fit on the adult sized pieces though. You can also fit Chamilia beads on a Pandora bracelet, or vice-versa. Are there any special tips you’d like for people to know about Chamilia? – The beads twist onto the bracelets and necklaces. I wouldn’t recommend wearing them in the shower or the pool. Any other information about Chamilia? – Chamilia is made in the USA and is the sister company of Pandora. Each piece is handmade, so it has that special look of each piece being pretty unique! Do the beads only come in sterling silver? – No, they come in 14k gold, mixed sterling and 14k gold, sterling and rose gold… They also come in Swarovski crystal, Italian murano glass and crystals! Anything else? – Chamilia is authorized to make Disney beads. Other bead companies aren’t! Thank you Ashleigh! Check out our entire Chamilia collection online here. This entry was posted in Employee Picks, Jewelry and tagged beads, chamila beads, chamilia, employee jewelry pick, glass beads, miss chamilia. Bookmark the permalink.